As 2011 draws to a close my thoughts naturally turn to the year ahead. The year in travel specifically. One of the best ways to get to know a destination is to learn about what makes it special. A festival, be it culinary, cultural or with another focus, brings a traveler to the center of that uniqueness. We bring you a festival a month in areas both well-known and relatively unknown. * Be advised – some of these events happen in parts of the world that are not as internet-obsessed as others. We’ll head you in the right direction, but once you’re there word of mouth might be the only way you’ll find what you’re looking for. This part of Australia is synonymous with wine. Just north of Adelaide lies the Barossa Valley which is home to many of the well-known wines from Down Under. On January 29, 2012 Adelaide hosts the Crush Festival. Entry is free, but you will pay for any tastings and food bites. It doesn’t get much colder than February in Quebec. 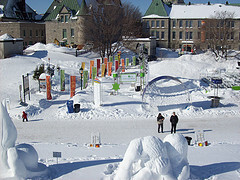 The Quebecois stay warm by attending the yearly Winter Carnival . This year’s fete runs from January 27-February 12 and includes events such as dogsled races, snow tubing and Bonhomme Carnaval sightings. Entry to the 2012 event is $13. The orchid is the national flower of Costa Rica with over 1400 different species and they are shown off at their best at the National Orchid Show held in San Jose every year in mid-March. While not all of these varieties are on display, there will be plenty to ogle along with many other varieties of indigenous flora. The Thai new year is April 13 and is celebrated country-wide with the Songkran Water Festival. Water is said to purify one for the upcoming year. Head to the streets during the 3 day celebration and don’t forget your water gun. For the literary types, the Writers Festival held from May 9-13 can’t be beat. It brings together writers and readers from around the world to participate in workshops and lectures. Almost 1,000 writers and an audience of over 25,000 are in attendance over the course of the event. If you’re a student, take advantage of the 50% discount. If you’re even a little bit interested in alternative music, the Baybeats Festival is something you don’t want to miss. The 2012 dates will be June 29-July 1 and will showcase some of the best up and coming new bands in Singapore and beyond. Folk, punk, metal and more are all represented. Here in the US it’s hard to imagine these critters as a food source, but that’s exactly what the Guinea Pig Festival celebrates. 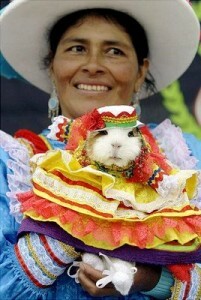 Cuy (guinea pig) is a major source of protein in much of the Andes region of Peru and yes, it does taste like chicken. During this fest, typically held late in July, the little guys are decked out in their finest togs to compete for the honor of being the best-dressed, biggest, etc. Be in Croatia the first weekend in August for the Sali Summer Festival. Singing, seafood and multiple sports events take center stage for this island’s celebration which culminates in the ever-popular donkey races the afternoon of the last day. The winning donkey takes home the proscuitto prize. For all things theatre the Arts On Foot weekend held in Penn Quarter the second weekend in September is where you need to be. The weekend is a cornucopia of dance, music, food, wine and art. Demonstrations from the many theatre groups that populate the metro area are free to view. Go there and you might discover that you DO like Shakespeare after all. If poetry in all it’s forms is your thing then you’ll be interested in Poetry Africa. Poets from all over Africa and beyond convene here to participate in open mic sessions, workshops and the like. Music and political discussions are also on the agenda. Mix great wines and food with some new independent films and you’ve got the Napa Valley Film Festival. Sister to the Sonoma Valley Film Festival in April, the Napa Valley incarnation is ramping up to be one of the pre-eminent film festivals in the country. If Sundance is out of your reach, give Napa a try. Forget the mall! For the ultimate in holiday shopping with some culture and tradition thrown in check out the famous Austrian Christmas Markets. Stroll through the stalls and keep warm with your mug of mulled wine. If you happen to be in any of these neighborhoods while any of these special events are happening be sure to check them out in person. And of course, let us know how it is!